You are here: Home / Healthcare opportunities / Aging / What if tech really could take 20 years off your age? What if tech really could take 20 years off your age? 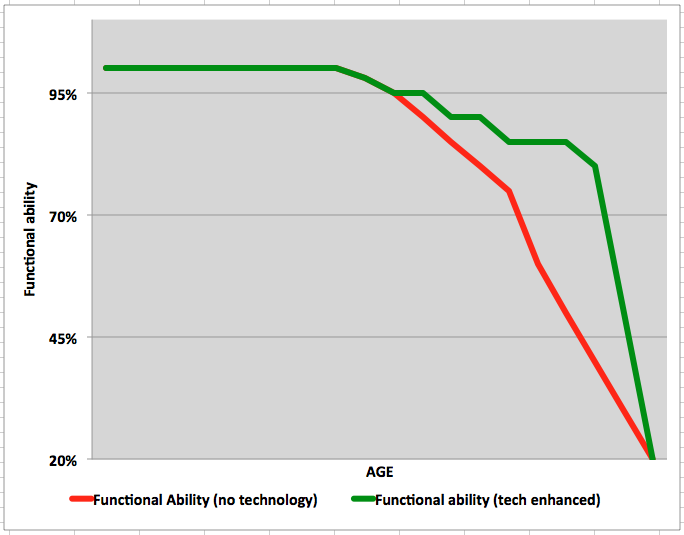 Functional ability declines with age. Can technology slow down the decline? Recently, I have been meeting quite a few new ventures in the “aging” space, and when I ask this question, I get a broad range of answers, many of which don’t quite resonate with me. I am convinced there are some very important “problems” that relate to the last decade or two of life, though. And some of them might well be solvable with judicious applications of technology. For example, here is one problem statement which gets me excited. What if we can push out the time at which we start to experience functional decline, or slow it down? For most of us, with age comes a gradual decline in our functional ability. We start having trouble with the instrumental activities of daily living (IADLs: (1)), and the activities of daily living (ADLs: (2)). And perhaps we experience some loss of cognition. And as these declines happen, the quality of life goes down rapidly. And we need help. And maybe we need to move out of our house so we can get taken care of by others. Ignoring for the moment the idea that technology might help us live longer, what if technology could enable us to function at a higher level in our later years than we would otherwise do, thus improving quality of life, postponing the need for more acute care, and likely saving the economy the high costs of caring for us in settings like long term care? That seems like a goal worth devoting some time and energy too, and smells like a great business concept. Now we just need to find or create products and technologies that can enable this vision of a tech-enhanced life. Do you have any specific ideas that fit this overall problem statement? If so, please comment below or contact me. 1. IADLs: activities related to independent living, such as preparing meals, managing money, shopping for groceries and personal items, performing housework, and using the telephone. 2. ADLs: activities related to personal care such as bathing, getting in and out of bed, walking, using the toilet, and eating. « Aging “gray tsunami”: challenge or opportunity?